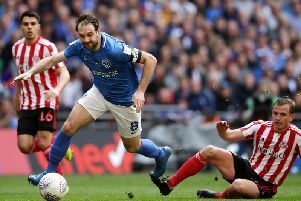 Looking ahead to Sunday’s Checkatrade Trophy final at Wembley we examine how the Black Cats have fared against Portsmouth in the past. The two sides have met 103 times in their history, Sunderland winning 37, drawing and losing 33 of them. They have played 99 times in the league with the last coming in December when Pompey beat a ten-man Sunderland 3-1 at Fratton Park. Prior to that, the last time the two sides faced was in February of 2010 when the Premier League teams drew 1-1. The Black Cats were leading in that game until the 96th minute when Aruna Dindane headed home a Jamie O’Hara cross. Darren Bent was the scorer for Sunderland that day as he converted from the spot as his side were down to nine men after Lee Cattermole and David Meyler were given their marching orders. The Wearsiders have not won the fixture since 2008, Kieran Richardson netted a brace to claim all three points. The biggest victory against Portsmouth has been two 5-0 wins, that happened way back in February 1928 and April 1936 - both in Football League Division One. The biggest defeat the Black Cats have had to endure against their soon-to-be-Wembley opponents was a 4-0 defeat that also happened in 1928, in December. The first meeting between the two sides was only a year earlier, a 3-3 draw in August 1927. Hopefully, Sunderland can avenge their defeat earlier in the season and claim their first piece of silverware of the season on Sunday afternoon.